After a summer of dining out -- because of my surgery -- it was nice to have the Lunch Bunch back at Linderhof. And it was a celebratory luncheon -- for my knees are done and I'm doing well. It is nice to be back in the kitchen and enjoying my three dear friends who joined me for lunch. And to celebrate we had lunch in the dining room instead of the breakfast room. It's October and the table says October -- leaves and pumpkins and burgundies and oranges and golds. The blue and white Spode, a special creamy cutwork napkin in the silver napkin rings, a gauzy square of burgundy with gold leaves and fringe. The menu featured a pumpkin -- it is October after all! 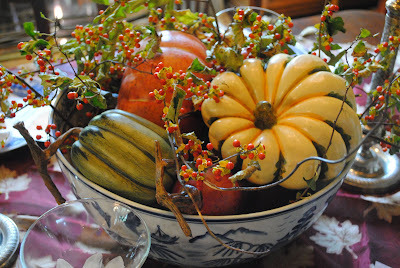 The centerpiece -- the big blue and white bowl filled with pumpkins, gourds and bittersweet. We enjoyed a leisurely lunch. Got caught up on everything that has happened over the summer -- trips taken and meals enjoyed. It is good to be back "in the saddle" again and being able to have friends gather around the table. It's Thursday which means that it's Tablescape Thursday at Susan's. Join her at Between Naps on the Porch to see all the other great tablescapes this Thursday! What an exquisite tablecloth! I even enlarged your photo so I could get a better view. . .so lovely! Yes, I know what yo mean by "back~in~the~saddle" again! Fall is a wonderful time to rekindle friendships. Glad you had a wonderful time on Linderhof with your luncheon. Keep those inspiring blogs coming my way! OMG, Martha! Great way to celebrate your knees with your dear friends! Beautiful as always! I am so glad your knees are feeling better. I really like your centerpiece. 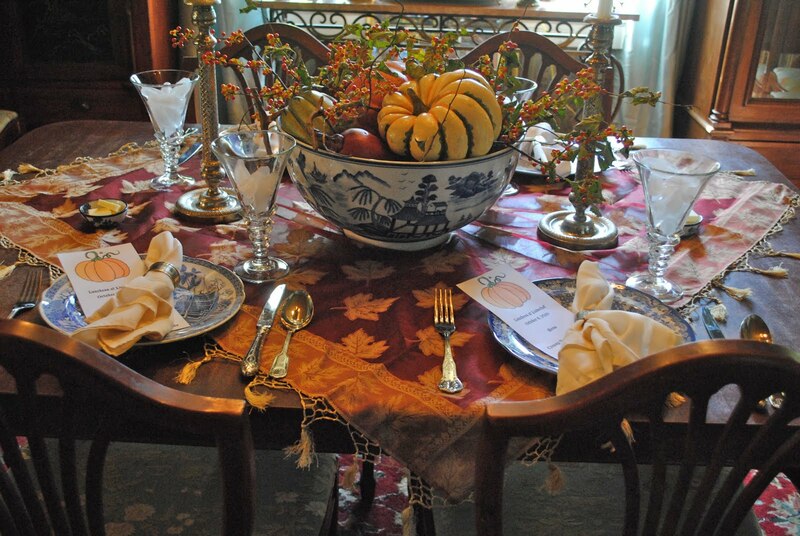 I also really like your blue and white for fall with that really gorgeous leaf table cover. It all looks very nice together. I love your centerpiece, Martha. 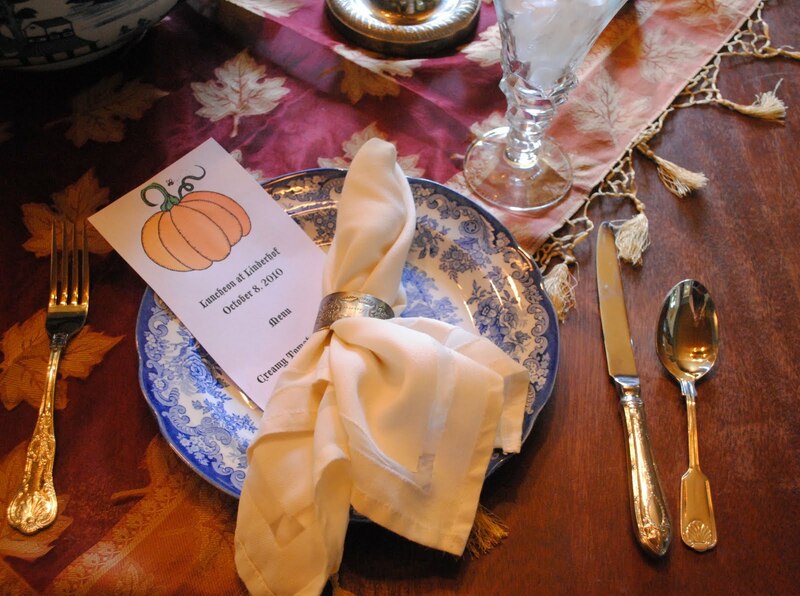 It is so special how you print up your menu for your meals too.This is a pretty tablescape. Glad you are feeling better. What a pretty table. The food sounds delicious... hope you share the recipes! Glad your back in the kitchen after your knee surgery! You have gorgeous pics of your place! Stopping by on the way back from BNOTP Thursdays. I love the gords and pumpkin centerpiece. I may add it to a post I plan to do on centerpieces! I promise to credit you! Hope you will stop by my place too! This is so beautiful, warm and welcoming! Really lovely. I'm glad you are back in the saddle now, just in time to treat us to the holidays at Linderhoff. I can't wait! Oh what a beautiful table set for fall. Your table always looks beautiful. So glad that your surgery is behind you now and you can frolic through fall! What a perfectly lovely fall table! I love everything about this table! The table cloth is gorgeous! The table is beautiful and the menu delicious. Glad you are again able to spend special time with your friends and I'm sure they are also happy. Beautiful.. I love your blue and white and you use it so well with the change of seasons and events. The table topper is exquisite. Glad to see you are back! Beautiful tablescape as usual. I love the blue and white spode. To me, blue and white is great any time of the year. I know it is great to catch up with friends. Our garden club is kicking in again next week. Stop by for a visit I put a couple of new posts. Lovely, Martha! So glad you're able to entertain again, and I know your friends are delighted, as well. Your table looks wonderful with all the fall touches. That centerpiece is my favorite -- perfect all fall! I'm intrigued by the individual front-on-the-pumpkin cakes. Will you tell us more about those? What a beautiful setting! I love how you used the blue and white china with your fall colors. So glad to hear your feeling better! Thank you for sharing this post! I have been fretting on how to use my blue & grey dishes for fall. Your table looks lovely. I will go and buy a fall tablecloth with autumn leaves. Thank you so much! It is so nice to be able to share lunch with friends after a long recovery. I am so glad you are feeling better! Your lunch bunch table is gorgeous as always. So good to know that you are now up to and able to do the things you always love. I didn't comment on yesterdays post but I always love seeing pics of you charming kitchen. Good to hear those knees are doing better! The centerpiece is just beautiful with the bittersweet added! Today's call volume is very slow so I thought I would drop by Between Naps on the Porch for a visit. I've been having a great time viewing the creative and beautiful tablescapes at her linky party. The napkin rings are stunning. I appreciate your mix of the blue Spode (I have some too and love it) with your fall setting. I have a problem thinking outside of the box and you showing that a table doesn't have to be totally in the fall color pallet to be beautify really helps tablescapers like me who need to think outside of their comfort zone. Thanks so much for sharing your beautiful fall table and I hope your knees are improving every day. 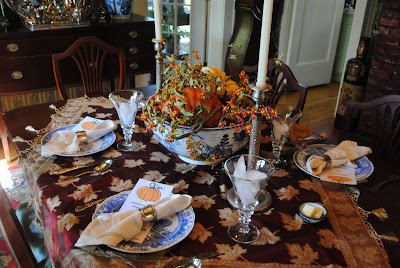 I enjoyed seeing this fabulous tablescape and how you incorporated the blue and white with fall elements. The menus are a delightful touch that makes the meal event extra special! Glad you are back again and able to spend a good time with your friends. And somehow we have atttended this nice lunch party, at least virtually. Your table looks great and the menu, too. I like especially the menu-card because I always make some for special events. Wonderful tablecloth and great arrangement. Your table is always so classic -- such a pleasure to see how you can adapt the blue and white for every season. What a gorgeous tablecloth! Your centerpiece is perfect too. Lovely, classic table. Perfect for a ladies lunch. What a beautiful tablecloth! Your table is so very lovely. This is so lovely, and I see you very much enjoy working with fall colors and textures, too. I'm a sucker for transferware--all colors--all seasons! Love the table and the menu!